Are you tired of feeling disorganized or frazzled during the holiday season? Are you overwhelmed with how many Christmas ideas are out there? Do you want a plan that is easy to follow this December? I've designed a Toddler Christmas Advent ebook to help you solve these problems and more! If you're ready to have your December planned for you, don't wait! Purchase our Toddler Christmas Advent ebook below. WHAT IS THE TODDLER CHRISTMAS ADVENT EBOOK? 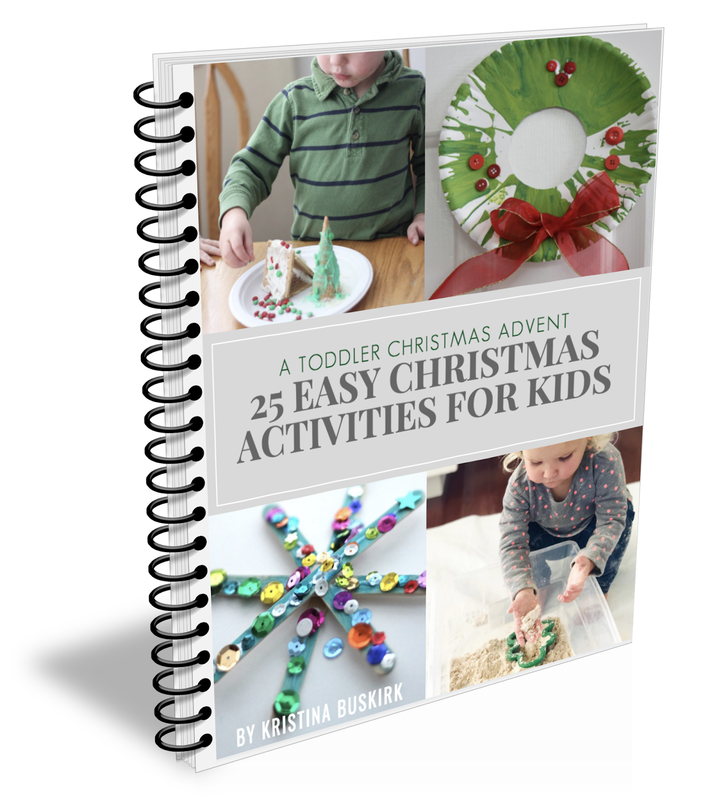 The Toddler Christmas Advent ebook is a 30 page digital ebook that includes 25 Christmas activity tutorials along 25 more bonus enrichment activities to try. The Advent activities can be done anytime during the month in any order, or participants can follow the advent calendar included in the bonus materials. I did all of the work of planning, so that you can spend your time being creative and having fun with your kids! The activity plans are filled with easy to follow, hands-on art, science, and sensory activities. 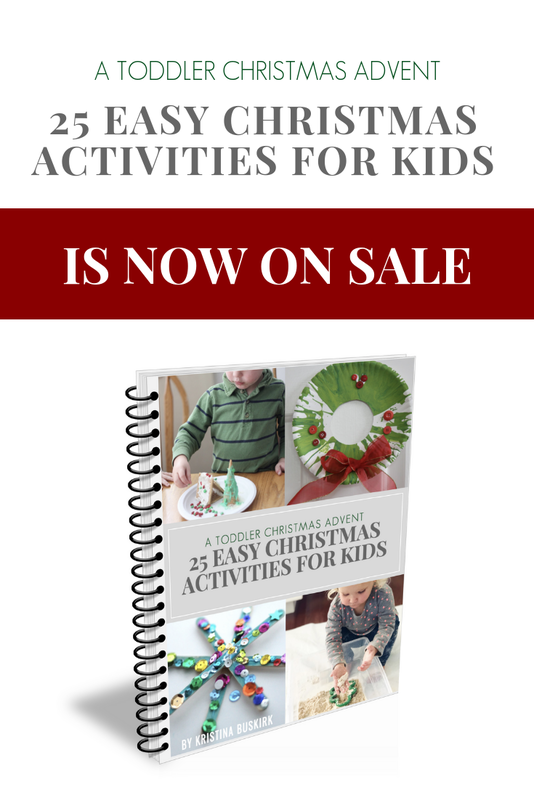 The Christmas activities shared in the ebook are not only fun, but they are also educational as well. WHAT DOES THE TODDLER CHRISTMAS ADVENT EBOOK INCLUDE? 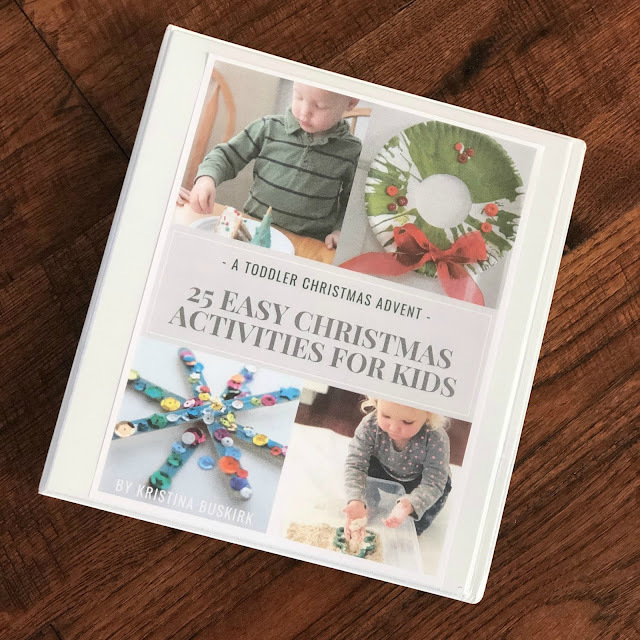 Our Toddler Christmas Advent is a 30 page ebook filled with simple Christmas themed crafts and activities for kids ages two and older! When you purchase the ebook, you will receive a downloadable file (pdf) to save on your computer or print out and use. Here are some printed out examples of what is included in the ebook. WHY SHOULD I PURCHASE THIS TODDLER CHRISTMAS ADVENT EBOOK? We save you time and brain power! We do all the planning and you get to have fun connecting, creating and playing with your kids. These advent activities were put together by me (an educator and a mom!). They are tried and tested by my kids and their friends. The activities are also educational! No more searching for ideas (or digging through Pinterest) to keep everyone happy! WHAT MAKES THIS ADVENT EBOOK SO SPECIAL? This advent is for perfectionists like me, who aspire to do something Christmasy every single day of December but fall short. This year’s advent has no rules and no dates. You can do one activity per day, a few activities per week, or even just pick a handful to do during the month and skip the rest. I am not deciding which day you should do what because you know more about how much time you have each day than I do. I will however give you a sample schedule if you need one. This is also a NO GUILT advent calendar... so do as much as you can/want and then don’t worry about it. No one is watching you! 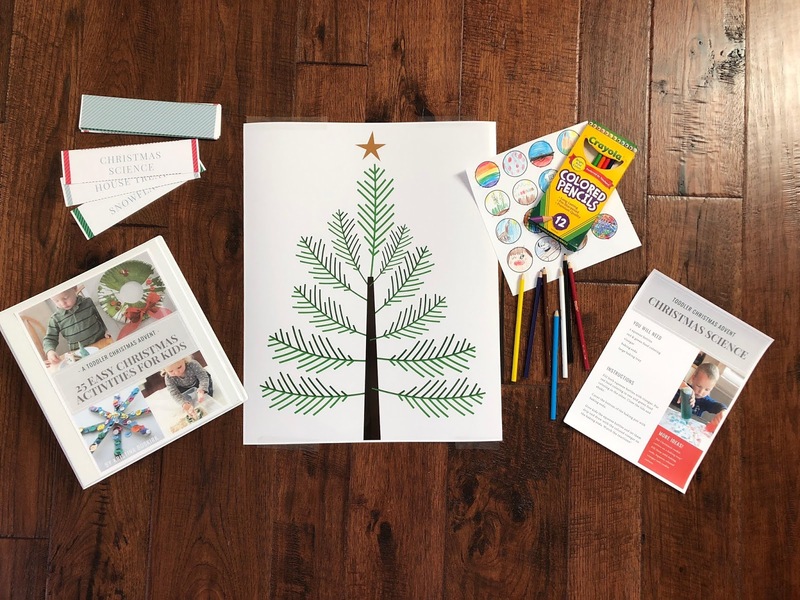 I created a simple little Christmas tree that you can print out and decorate with an ornament as you complete each activity. The tree will look cute with five ornaments or 25, so don’t worry if you don’t fit every last one in during this busy time of year! 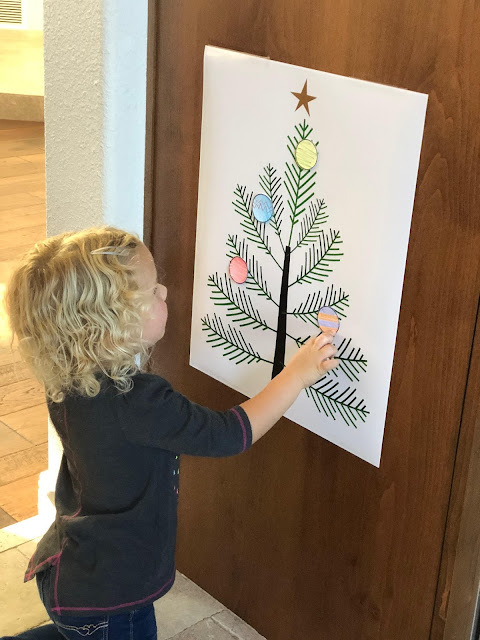 The goal for this Toddler Christmas Advent is to have fun connecting with your family and creating together. HOW IS THIS DIFFERENT FROM THE FREE MONTHLY PLAY PLAN? My free December Play Plan will go out with a calendar at the end of the month. Each day on the calendar will have an activity and you can click on the activity to be taken to the tutorial. The free calendar is simple and easy, but our Toddler Christmas Advent is more user friendly and organized. I spent a lot of time creating tutorials and materials lists and photographing the activities and putting them all in one ebook for you. So instead of clicking around to different sites, everything is all in one place and easy to find each day. You can just download the ebook to keep on your phone or print it out and stash it in a binder. Our Toddler Christmas Advent is also available to you over two weeks before December starts, so you can get organized and start planning early, while our December Play Plan will go out on November 30th. Our Toddler Christmas Advent ebook (+ bonus items) costs $4.99. This is about as much as 2 cups of coffee at Starbucks OR one pint of Ben & Jerry’s ice cream, OR a kid's Happy Meal at McDonalds. The value of this ebook and the bonus materials (including 1:1 help from me whenever you need it during December) is worth far more than $4.99, but I recognize that you have a lot of other expenses in December... so I kept the price down. Make sure you don't miss out on this great offer while it is at this low price! DO YOU HAVE MORE QUESTIONS? Check out our sales page HERE with more information.